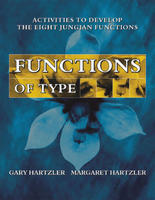 This publication, which is only 60 pages long, is intended to help you to “strengthen your mental data-collection and decision-making skills” by “becoming aware of ourselves and the ways that we collect data and make decisions.” It starts out with a few pages on the topic of type development and then quickly jumps into a chapter on each of the 8 cognitive functions, which is really the heart of the book. Each chapter includes a couple of pages describing the function and then there is a one-page self-assessment of your skills with respect to that function. After that, there are two pages of material helping to describe specific things that you can do to develop that function. For example, for introverted sensing, it describes activities you can perform to engage sequential perception and recall, compare the present to the past, record precise memories, bring past experiences to the present, etc. At the end of the chapter, there is a page for you to write down notes on the activities you performed, your reactions/comments and “what to do next time”. I guess this is really more accurately referred to as a workbook than a book. I have some questions on how effectively you can develop/use non-preferred functions but in either case, I thought the material was very good. I highly recommend this. I've been considering getting this, or Dario Nardi's '8 Keys to Self Leadership: From Awareness to Action'. Like you, I have questions about our ability to develop some functions, and I especially find it questionable how one could argue that different types can and should develop a particular function in the same way. It would seem to me that developing a function would have a lot to do with where it is placed in your functional order. As such, I've been a bit skeptical about the book's premise, and have been leaning towards the Nardi book. I have both. Nardi's book is about 200 pages. I think I like this one a bit more. It is partly a presentation thing. It's very concise and well organized. You'll get bullet points in this vs. Nardi's narrative. I wouldn't hesitate to purchase either though. I got this book a long time ago. I like that it can give concrete examples of what kind of activities each function can encompass. And it got to the point very quickly. I liked that too. But I still have a hard time developing functions in the proactive sense of doing all those examples. I think that it takes a considerable amount of time. And also, I found that the best way to know if you're using the function well, is to get feedback from someone with that dominant function. For example, for Ni, one of the points in the book says: As you read an advertisement, translate the expressions into the true meaning behind the words. I unconsciously already try to do that. (I don't even feel like I could stop myself from doing that actually) But there's no way of measuring if I'm actually good at it. Anyways, one of the really funny things I noticed when I first read about Te, was that I found myself going "Pfffft, easy. Where's the hard stuff?" I showed my ISFJ friend the Si pages and he said the same thing. So in that way, it can be quite telling of your natural preferences imo. Which Types Tend To Be The Most Aggressive Drivers? Which Types Tend to Have the Broadest Range of Interests? Jack of all trades, master of none. Trying to pay the bills. Type and Reductionism: Is It Time to Move Away From the Eight-Functions Model?